Care Enroll helps healthcare providers and health plans achieve their mission and widen public access to healthcare by serving both our clients and our clients’ members, identifying client needs, and customizing solutions that extend beyond the traditional client relationship. Helping patients become covered patients. Quality healthcare begins with enrollment in the right health plan for every member. That’s where we help. 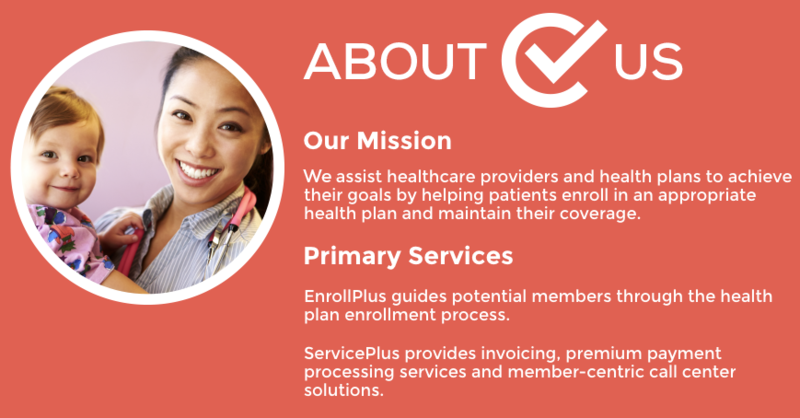 EnrollPlus guides patients through the sometimes complex health plan enrollment process and takes a comprehensive, personalized approach that removes potential guesswork and confusion. Our attentive, experienced specialists, located at client facilities and at our Call Centers, work one-on-one with patients to uncover the plan that’s best for them—whether it be through a federal or state government program, a marketplace insurance plan or another healthcare benefit solution. Going beyond information-gathering, we become patient advocates by answering questions, exploring options, providing follow-up support and maintaining contact with members to ensure that annual renewals are filed. Through our consultative approach, patient needs are uncovered and addressed quickly and efficiently, improving your satisfaction ratings and increasing patient loyalty. Our services are integrated seamlessly into our clients’ workflows, allowing your staff to attend to other important tasks. Because access to healthcare is widened, demand for your services is increased. By assisting uninsured patients to find coverage, your cash flow is improved, write-offs are minimized and community health needs are better addressed. Helping to ensure that members remain members. We understand that maintaining healthcare coverage is just as important as obtaining that coverage. ServicePlus works for both our clients and their members by 1) overseeing the entire payment process for our clients, from invoicing to processing payments and all things in between, and 2) assisting our clients’ members to ensure that they understand and honor the financial commitment of their plan. Through our services, members can focus on their health—not on their health plan. Customized solutions for invoicing, payment and follow-up are tailored to the specific needs of the health plan. We treat your members as if they were our members. Courteous, helpful and timely follow-up from our Call Center representatives increases member satisfaction and retention. Our team are subject-matter experts for the programs and plans we support. Prompt attention to time-sensitive projects, special reports and audits keep your processes running smoothly. A regional hospital system needed to address the trend of substantial increases in its uninsured population. Similar to many healthcare systems across the country, the hospital’s population was converting to increasingly higher deductibles—or losing coverage altogether—while simultaneously confronting demands to increase the levels of charitable care. It was important to craft a solution that: 1) provided a strong return on investment (ROI), 2) was patient-friendly, and 3) reinforced the patient/provider bond. Typically, enrollment companies take a narrow view of their role and the programs they support; often relying solely on programs with retro-active reimbursement. Our belief, and that of our client, was that if the patients’ concerns were put first, and if they were enrolled in the most suitable and productive program for their given situation, enrollees would remain loyal, satisfied patients of the facility that assisted them. Consequently, we began enrolling patients in the Healthy Indiana Plan and other programs without retro-active reimbursement, but with the best possible future benefits for the patient. We tracked the results for the subsequent 12-month benefit period in each instance of an application being submitted. More than 90% of the patients submitting an application were approved, and the expansion of the enrollment program had an 862% ROI. Patients consistently reported seeing value in the assistance, and 62% of approved patients had future encounters and retained the services of the health system over other local providers. Phil founded CareEnroll with a clear mission: Maximizing access to healthcare by identifying client needs and creating solutions that extend beyond the traditional client relationship. CareEnroll’s evolution is the result of Phil’s diverse background in sales and marketing, operations management and information technology management. While serving as the first director of IT for the McKee Group/Argent Healthcare Financial Services, Phil was responsible for many of the technologies and innovations that brought efficiency and control to the Self Pay and Eligibility Assistance programs. As founder and COO of Vision Self Pay Revenue Recovery, Phil was the major force behind the implementation of new products and technologies that created positive impact on the effectiveness and efficiency of the staff and overall operation, while achieving a high level of client and patient satisfaction. Phil’s unique expertise and insight inform his forward-thinking approach to his work and to the company’s mission of elevating itself beyond vendor services. Phil leads his team to become trusted advisors to clients by delivering comprehensive financial, technical, and operational results customized to their needs. Phil holds a BA in Economics from Wabash College. In his role as Director of Business Development, Dan is responsible for market knowledge and product development, business strategy, marketing/sales and client relationships. Dan combines his diverse background in a way which is impactful and evolutionary to both his role at CareEnroll and to the mission of the company. Dan has had a 35-year career in the healthcare industry, serving in executive positions for the health system/hospital and healthcare consulting fields. He also worked as an officer for Novation and Service Master. Dan holds a BS from Indiana University’s Kelly School of Business and a JD from Indiana University School of Law. As Director of Human Resources, Paul implements employee- and staff-based policies and procedures, including innovative strategies to increase employee engagement and workforce development. With almost 30 years of Human Resource management experience with companies large and small, Paul has built and developed HR departments where none have existed. He has extensive experience and interest in organizational development, training process implementation, and culture definition and improvement. Bobbi directs EnrollPlus operations with an emphasis on outstanding service delivery and cultivation of strong client relations. Bobbi leads her team to be advocates for their clients’ members by uncovering and addressing needs and providing tailored solutions for them. Bobbi holds a BA in Organizational Leadership from Indiana State University. In addition to tracking a wealth of client services, Roxanne acts as a liaison between CareEnroll’s team and clients and also manages project implementation. As Vision’s (doing business as CareEnroll) first employee, Roxanne approaches her work with great passion. She believes that meeting and improving client needs and expectations are just the beginning. Roxanne has an Associate degree in Business Management from Purdue University. In her role, Dina mentors, trains, and oversees the Call Center counselors whom assist hospital patients. Dina’s professional experience in healthcare over the past 15 years includes compliance regulation, operations improvement, and managing a team of dedicated Customer Service Representatives. As a licensed Indiana Navigator, Dina embraces the core values of integrity and compassion when helping patients find solutions to their insurance struggles. In her role, Lauren trains, directs, and supports remote staff and develops and manages client relations. Lauren has extensive experience in international business relations after having living abroad for many years, which gives her a unique understanding of various business environments. She embodies the core values of compassion and sincerity for all those she comes in contact with. Lauren holds an MBA from the University of Indianapolis. To learn more about EnrollPlus and ServicePlus, please submit your inquiry using the contact form below.